From about the moment we left our cribs, mom had us swaddled in Ralph Lauren. And as we and the brand got a little bit older, she had spectacular luck finding incredible pieces at thrift stores, which we'd mix in with our new things. I remember loving my navy blue blazer with burgundy grosgrain trim...and my adorable little pink pleated mini-skit that I wore with leather braces in kindergarten...and my three pairs of Polo saddle shoes (white ones with red, green and yellow "saddles", respectively) when I was in second grade (with feet big enough to fit into a woman's 5). As adults, we covet these clothes and I, like a master apprentice, can spot a Ralph Lauren sweater from 100 feet the moment I hit a thrift store. It will almost bring me to tears if said sweater is a man's XL. So, we're both pretty freaking giddy to be featured as vintage Ralph collectors on the brand's new Japanese e-commerce site. On top of it being Ralph Lauren...it's our dream of seeing our names (not in lights, but) next to Japanese characters come true. If anyone at RL HQ is seeing this, I believe that the Hovey girls should be made ambassadors to the brand...! I agree with Heather! 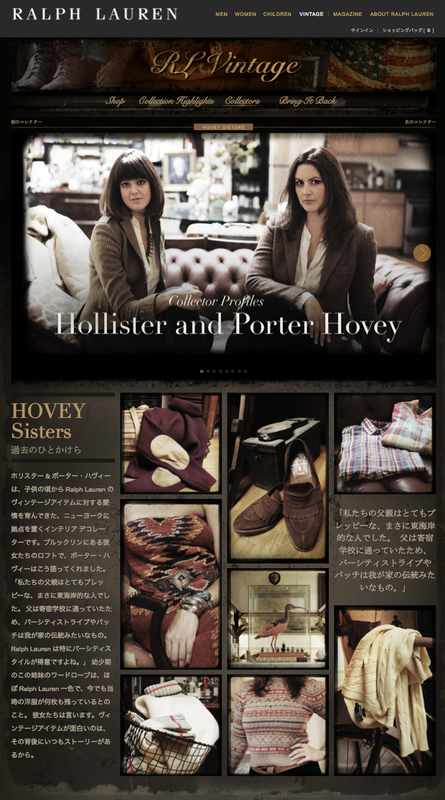 Who better than the internationally acclaimed Hollister and Porter Hovey! Wow! Congratulations to you both. Well done! Amazing! I've been following your blog for many years and it's so inspiring to watch your careers unfold. Congratulations!